If Kaliaera was ‘the city of sunshine’, the arboreal jungles that made up the remaining southlands were a balancing, verdant twilight. I was warned repeatedly that venturing beyond the city walls was an almost certain death sentence, but I would not be deterred: I was too close to securing another piece of the puzzle. In recent years a hidden pattern had started to reveal itself in the worldwide media of Providence. Rags, tabloids and broadsheets had become unusually filled with the recent exploits of famed (and infamous) explorers and archaeologists as they proudly declaimed their latest, ancient discoveries. Indeed, it was one of my more learned associates, Professor Humbolt Copernicus, whom had proposed to me of a linked history between the archaic edifices of this world and enlisted my aid to uncover further proof to his hypothesis. That was three years ago and so far it was appearing that his assertions were become more and more conclusive with every site I searched. Kaliaera though was proving a much more formidable region to traverse, and despite the fact I considered myself something of an inveterate traveller of exotic lands, the dank humidity of the jungle southlands was a seriously punishing endeavour. Even my canine companion, a snowy-haired hound called Sleet, who had been ever at my side as I traversed windy mountains and frigid steppes, was suffering; lying exhausted upon a nearby rock, panting and whimpering. My guide, a haggard and unwashed rogue, from the city’s paramilitary (and the only individual lunatic enough to venture out this far, I am assuredly told) who answered to the name of ‘General’ Alcazar had, so far, dutifully escorted me to the location of the ruins in recompense for a reasonable sum of money. He was now stood nearby, rifle in arms and gazing intently at the thick canopy above. I was not certain, but I swear I could hear him muttering something about eyes on us in the trees as he ruminated upon the stub of a thick cigar, sat firm between his unshaven lips. I wiped away another trickle of sweat with a damp cuff as it rolled down the black Bakelite skin of my cam-visor before returning to the arduous task of ripping away entrenched vines from the surface of large carved stone, embossed with unfathomable runes. I was looking for one character in particular, one with seemed to bridge the gulf of time and distance, one which had so far appeared at all the sites I had visited. There! Almost disguised in the large body of indecipherable text was a sigil that blurred when you looked at it directly and caused a sharp migraine pain to erupt behind the eyes. Even as the flash-image of tentacles which spurred from my imagination faded, I was jubilant that I had found further evidence for the Professor. “So, it is here too then,” affirmed a cultured voice from behind me and one that I instantly recognised. I drew the Lockyer .32 handgun that I had borrowed from the General from under the flap of my rucksack lying next to me and stood slowly, prepared to meet my nemesis…. So, my first character for the 40Kthulhu project is Remi Étain, writer and investigative journalist extraordinaire with his faithful hound Sleet. 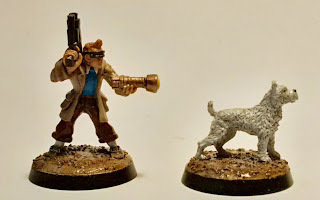 Naturally my inspiration for Remi is Hergé's internationally renown character Tintin, and the rest of my planned warband will include members inspired by the supporting cast. It was actually a single panel from the graphic novel 'Tintin in Tibet' that prompted this whole decision. 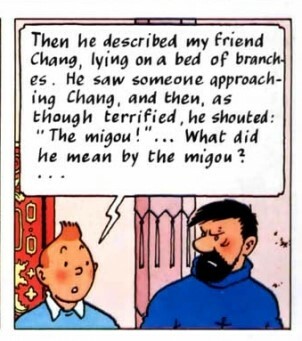 Tintin is a great inspiration for a character! Blending 3 inspirations into one is no mean feat ! I'm loving it ! I really love the vibe you've created with the text. Do you plan to create your unwashed guide, 'General' Alcazar?